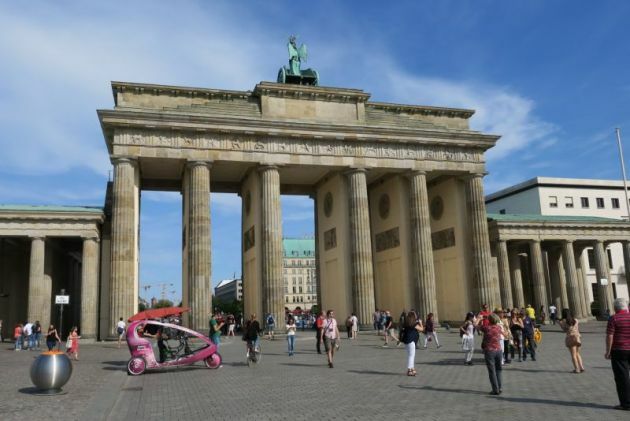 (Photo: © Peter Kenny)The Brandenburger Gate on August 26, 2015. More than 100,000 Christians are expected to flock to Berlin, Germany next week where Angela Merkel and Barack Obama will kick off the Ascension Day weekend of the 36th Protestant Kirchentag (Church Assembly) under the iconic Brandenburger Gate. In his first major appearance since leaving the U.S. presidency, Obama will join German Chancellor Merkel on Ascension Day, May 25, in a conversation to talk about "Being Involved in Democracy: Taking on Responsibility Locally and Globally". About 80,000 people are expected to attend the open-air event that is jointly organised by the Obama Foundation and the Kirchentag. Lutheran bishop Heinrich Bedford-Strohm, the head of the EKD, the body representing Germany's 25 million Protestants said "President Barack Obama's attending the Kirchentag in Berlin, which will ring in the Reformation Summer. "It underlines the international character of our 500th anniversary celebrations. The churches form a global civil society network of over two billion Christians. "Together, as people of faith, we live from the firm hope for a better world. Anyone who is pious also has to be politically minded," said Bedford-Strohm, who will chair the conversation between the two world leaders. Obama's presence will coincide with President Donald Trump's first foreign visit to NATO and the G7 on May 25. The evening before on May 24, three open-air services in Berlin will officially start the spiritual part of the Kirchentag, followed by a huge street market and a chance for participants to mingle. With over 2,000 events in Berlin and Wittenberg over the four-day weekend, Germany's Reformation Summer officially starts to commemorate 500 years ago when the then Catholic priest Martin Luther nailed 95 theses against the Wittenberg Church door, setting in motion the Reformation. There will be political and spiritual discussions, cultural events and various art and historical exhibitions. The bi-annual Kirchentag was started by lay Protestant Christians after the Second World War to confront and deal with the complacency of the churches during the Nazi regime. During the 1970s and 1980s, it became a platform for the peace movement and Christian pacifism. The current president of the Kirchentag, Swiss theologian Christina Aus der Au has stressed, "We are continuing in that tradition to look at and question our societies." The Kirchentag will end with an ecumenical open-air service in Wittenberg on Ascension Day Sunday. The outspoken South African Anglican Archbishop Thabo Makgoba will lead the service. It is expected that about 20,000 people will attend this service. In Wittenberg, the origin of the Reformation, the churches and the German State have been preparing for the last decade. Yet nowhere else in Germany are the numbers of Protestants lower than here in the town where Luther lived and worked for much of his life. There are only 15 percent Christians in the town itself and in the surrounding East German federal state of Saxony Anhalt only 14.7 percent of the people call themselves Protestant, seen as the result of more than 40 years of East German Communist rule. It is also in these former East German regions where support for the ultra-right wing party the AFD is most prevalent. The party has a "Christians in the AFD" section and their leader Frauke Petry was previously married to a Lutheran pastor in a congregation near Leipzig. She herself sang in the Leipzig Bach choir and played church organ. In a controversial move the Protestant bishop of Berlin Markus Dröge and a representative of Christians in the AFD will debate each other on stage. Outraged Kirchentag participants have started a petition to try and prevent this event from taking place next week. Dröge however told the German religious news agencies – kna (Catholic) and epd (Protestant) this week: "I trust in the culture of dialogue of the Kirchentag. I have also spoken with AFD members in private. I have even invited those who sent me e-mails for a cup of tea in my office and talked quite extensively to them." In a more and more secular German society the Kirchentag will also try and reach out to non-believers Aus der Au said. In a city where the influx of refugees is felt, the Kirchentag has encouraged the active participation of refugees. Other events will include ecumenical and inter-faith dialogue. One of the highlights will be a discussion between Germany's conservative Interior Minister Thomas de Maizière and the Grand Imam of the al-Azhar Mosque in Cairo, Sheikh Ahmad al-Tayyeb, the leader of the world's Sunni Muslims. While the Berlin Kirchentag will be a more global event, eight other East German towns and cities where Martin Luther was active or his presence felt, will celebrate six individual local Kirchentage with the focus on themes closer to home. These cities are: Leipzig, Magdeburg, Erfurt, Jena/ Weimar, Dessau-Roßlau and Halle/Eisleben. The six Kirchentage will encompass an additional 2,000 cultural, spiritual and tourism events. After the Kirchentag, the Reformation celebrations will continue until the 31 October anniversary.